As your baby gets older, their nutritional needs grow and develop. Exclusive feeding with breast milk or Holle Infant Formula 1 Baby Milk may no longer fully satisfy your baby. The time to start weaning your baby or to change from breast milk or Infant Formula 1 to Follow-on Milk 2 depends entirely on your baby’s needs. As long as your baby is happy and full after a feed you can continue to give your usual milk. If your baby is showing signs of needing more food after 4 months, or if at 6 months of age you may wish to start to wean your baby onto solid foods, this means that some bottle feeds are gradually replaced by purées and porridges. This is the time that you can also change to Follow-on Formula 2 without problems. Unlike Infant Formula 1, Follow-on Formula 2 is to be given as part of a balanced weaning diet of bottle feeds and purées and porridges and is not to be given exclusively. 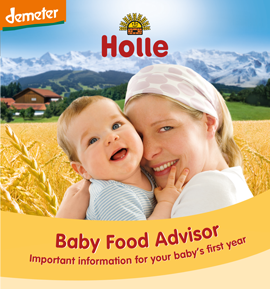 The Holle weaning chart is designed in accordance with guidelines issued by The Research Institute for Child Nutrition and gives you recommendations for your child's diet plan. If you have, as suggested, breastfed your baby fully for six months then the ages shown in the chart below will move forward accordingly. Note: As each infant is unique and knows what he or she prefers, it is natural that the individual diet may vary from the table above.